On 26 January 1924, five days after Lenin's death, Petrograd was renamed Leningrad. Later some streets and other toponyms were renamed accordingly. The city has over 230 places associated with the life and activities of Lenin. Some of them were turned into museums, including the cruiser Aurora���a symbol of the October Revolution and the oldest ship in the Russian Navy. Average annual precipitation varies across the city, averaging 660 mm (26 in) per year and reaching maximum in late summer. Soil moisture is almost always high because of lower evapotranspiration due to the cool climate. Air humidity is 78% on average, and there are, on average, 165 overcast days per year. A 14- to 15-letter-long name, composed of the three roots proved too cumbersome, and a lot of shortened versions appeared in habitual use. The first General Governor of the city Menshikov is maybe also the author of the first nickname of Petersburg which he called Петри (Petri). It took some years until the known Russian spelling of this name finally settled. In 1740s Mikhail Lomonosov uses a derivative of Greek: Πετρόπολις (Petropolis, Петр��полис) in a Russified form Petropol' (Петрополь). A combo Piterpol (Питерпол) also appears at this time. In any case, eventually the usage of prefix "Sankt-" ceased except for the formal official documents, where a three-letter abbreviation "СПб" (SPb) was very widely used as well. ^ a b In the pre-1918 Russian orthography, these names were spelled Санктъ-Петербургъ and Петроградъ with a trailing hard sign. ^ Госстандарт Российской Федерации. №ОК 024-95 27 декабря 1995 г. «Общероссийский классификатор экономических регионов. 2. Экономические районы��, в ред. Изменения №5/2001 ОКЭР. (Gosstandart of the Russian Federation. 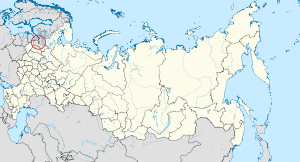 #OK 024-95 December 27, 1995 Russian Classification of Economic Regions. 2. Economic Regions, as amended by the Amendment #5/2001 OKER. ). ^ a b "Александр Беглов назначен врио Губернатора Санкт-Петербурга" (in Russian). Rambler news. 3 October 2018. Retrieved 3 October 2018. ^ Федеральная служба государственной статистики (Federal State Statistics Service) (21 May 2004). "Территория, число районов, населённых пунктов и сельских администраций по субъектам Российской Федерации (Territory, Number of Districts, Inhabited Localities, and Rural Administration by Federal Subjects of the Russian Federation)". Всероссийская перепись населения 2002 года (All-Russia Population Census of 2002) (in Russian). Federal State Statistics Service. Retrieved 1 November 2011. ^ McColl, R.W., ed. (2005). Encyclopedia of world geography. 1. New York: Infobase Publishing. pp. 633–634. ISBN 978-0-8160-5786-3. Retrieved 9 February 2011. ^ "Exploring St. Petersburg / The Hermitage". Geographia.com. 6 January 1990. Retrieved 25 January 2010. ^ Schmemann, Serge. "Leningrad, Petersburg and the Great Name Debate". ^ a b "Петроград – Энциклопедия "Вокруг света"". www.vokrugsveta.ru. ^ "St. Petersburg | European Council". Retrieved 15 April 2019. ^ "Entdecken Sie die Schönheit des Russischen Venedig - St. Petersburg (CB-02)". ^ "Winter in St. Petersburg". www.autentic-distribution.com. Retrieved 18 April 2019. ^ "St.Petersburg White Nights Tour - Individual Tours to St Petersburg Russia". www.prioratours.com. Retrieved 18 April 2019. ^ a b Wilson, Derek (2010). Peter the Great. Macmillan. p. 82. ISBN 978-1429964678. Retrieved 25 February 2012. ^ Williams, Harold (1914). Russia of the Russians. Pitman & Sons. p. 33. Retrieved 12 February 2016. ^ Hughes, Lindsey (2004). 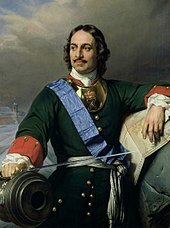 Peter the Great: a Biography. Yale University Press. p. 66. ISBN 978-0-300-10300-7. ^ "Peter and Paul Fortress". Saint-Petersburg.com. Archived from the original on 20 July 2008. Retrieved 19 June 2009. ^ "Consulate General of Sweden – Sweden and Saint Petersburg". Swedenabroad.com. 17 October 2005. Archived from the original on 8 January 2009. Retrieved 6 January 2009. ^ "Jean-Baptiste Le Blond, architect in St. Petersburg, Russia". saint-petersburg.com. ^ "The common characteristic of Saint-Petersburg". russia-travel.ws. 2005–2008. Retrieved 9 February 2011. ^ Kann, Pavel Yakovlevich (1963). Leningrad: A Short Guide. Moscow: Foreign Languages Publishing House. pp. 132–133. Retrieved 9 February 2011. ^ a b c "Ленинградская область в целом: Административно-территориальное деление Ленинградской области". Lenobltrans.narod.ru. Archived from the original on 8 June 2009. Retrieved 22 October 2009. ^ "The Russian historian giving Stalin's victims back their identity". France 24. 29 January 2018. ^ Zubkova, Elena Yurievna (1998). "Chronology of Major Events". In Hugh Ragsdale (ed.). Russia after the war: hopes, illusions, and disappointments, 1945–1957. New York: M.E. Sharpe, Inc. pp. 132–133. ISBN 978-0-7656-0227-5. ^ a b Orttung, Robert W. (1995). "Chronology of Major Events". From Leningrad to Saint Petersburg. London and New York: Palgrave Macmillan. pp. 273–277. ISBN 978-0-312-12080-1. ^ Ollman, Leah (3 August 2001). "Russian Photos Trace Images of Mortality and Memory". Los Angeles Times. Retrieved 25 August 2018. ^ Dunne, Aiden (17 May 2007). "Camera in a City of Shadows". The Irish Times. Dublin. Retrieved 25 August 2018. ^ "CАНКТ ПЕТЕРБУРГ ВАЛОВОЙ РЕГИОНАЛЬНЫЙ ПРОДУКТ в 1998–2003 гг" (PDF) (in Russian). gks.ru. Retrieved 13 November 2018. ^ Zagraevsky, Sergey (2008). "Will Saint Petersburg share the same fate as Moscow?". Zagraevsky.com. Retrieved 16 November 2012. ^ "Photos of the violations of the historical environment of Saint Petersburg". Rusarch.ru. Retrieved 22 October 2009. ^ Nezhikhovsky, R.A. Река Нева и Невская губа [The Neva River and Neva Bay], Leningrad: Gidrometeoizdat, 1981. ^ a b "Pogoda.ru.net" (in Russian). Weather and Climate (Погода и климат). Retrieved 29 March 2013. ^ "Climate St. Peterburg – Historical weather records". Tutiempo.net. Retrieved 16 November 2012. ^ "Архив погоды в Санкт-Петербурге, Санкт-Петербург". Rp5.ru. Retrieved 16 November 2012. ^ "Climatological Information for St.Petersburg, Russia". Hong Kong Observatory. Retrieved 29 March 2013. ^ "Leningrad, Petersburg and the Great Name Debate". The New York Times. 13 June 1991. ^ Masters, Tom; Richmond, Simon (2015). Lonely Planet St Petersburg. Lonely Planet. ISBN 978-1743605035 – via Google Books. ^ a b Nesterov, V. "Знаешь ли ты свой город" ("Do you know your city?"). Leningrad, 1958, p. 58. ^ "31 August 1914 St.Petersburg renamed to Petrograd" (in Russian). Archived from the original on 25 August 2011. Retrieved 14 January 2011. ^ "St Petersburg, the 'Venice of the North', gets its own fleet of gondolas". The Independent. London. 29 June 2004. Archived from the original on 20 October 2011. Retrieved 7 December 2010. ^ "Естественное движение насе��ения в разрезе субъектов Российской Федерации". gks.ru. ^ "Каталог публикаций::Федеральная служба государственной статистики". gks.ru. ^ Chistyakova, N. Третье сокращение численности населения... и последнее? Demoscope Weekly 163 – 164, 1–15 August 2004. ^ a b "Естественное движение населения в разрезе субъектов Российской Федерации". 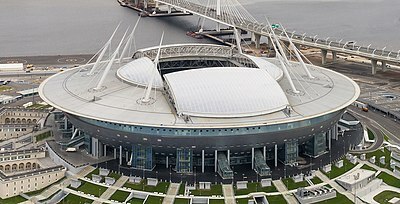 www.gks.ru. ^ "В первом полугодии продолжалось умеренное повышение числа рождений". Demoscope.ru. Retrieved 6 January 2009. ^ "The Constitution of the Russian federation". Constitution.ru. Retrieved 22 October 2009. 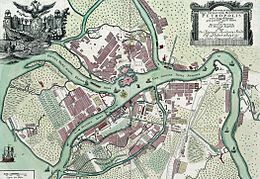 ^ "Russian source: Charter of Saint Petersburg City". Gov.spb.ru. Retrieved 22 October 2009. ^ "Федеральный закон от 02.05.2012 N 40-ФЗ "О внесении изменений в Федеральный закон "Об общих принципах организации законодательных (представительных) и исполнительных органов государственной власти субъектов Российской Федерации" и Федеральный закон "Об основных гарантиях избирательных прав и права на участие в референдуме граждан Российской Федерации"". garant.ru. ^ "Закон Санкт-Петербурга от 26.06.2012 N 339-59". ppt.ru. ^ "Official website of the Northwestern Federal District (Russian)". Szfo.ru. 25 June 2009. Archived from the original on 16 February 2008. Retrieved 22 October 2009. ^ "ЗАО "Терра-Нова" | Крупнейший в Европе проект по образ��ванию и комплексному развитию территории в западной части Васильевского острова Санкт-Петербурга". Mfspb.ru. 12 March 2012. Retrieved 16 November 2012. ^ "Budget of Saint Petersburg (Russian document)". City of Saint Petersburg. ^ "Валовой региональный продукт по субъектам Российской Федерации в 1998–2016гг. (в текущих основных ценах; млн.рублей)". Gks.ru. Retrieved 22 October 2009. ^ "Валовой региональный продукт на душу населен��я (в текущих основных ценах; рублей)". Gks.ru. Retrieved 22 October 2009. ^ "Отраслевая структура ВРП по видам экономической деятельности (по ОКВЭД) за 2005 год". Gks.ru. Retrieved 22 October 2009. ^ "Passport of St. Petersburg Industrial Zones" (PDF). regionen-russland.de. 2015. p. 2. Archived from the original (PDF) on 26 December 2017. ^ "St. Petersburg Historic Skyline, Russian Federation". Wmf.org. Retrieved 22 October 2009. ^ "График разводки мостов на Неве в Санкт-Петербурге". Archived from the original on 27 August 2010. Retrieved 3 October 2010. ^ Hudyakov, Artyom (12 March 2008). "Виртуальная защита Петербурга" [Virtual protection of Petersburg] (in Russian). bn.ru/. Retrieved 5 August 2009. ^ "Visit Saint Petersburg". Visit-Petersburg.ru. Retrieved 20 September 2016. ^ "Saint Petersburg Tourist Information Bureau". Petersburg.ru. Retrieved 20 September 2016. ^ "Welcome to Saint Petersburg!". Saint-Petersburg.com. Retrieved 20 September 2016. ^ "National Geographic – Saint Petersburg, Russia". NationalGeographic.com. Retrieved 20 September 2016. ^ "Saint Petersburg is a Stroll Along A Lovely Canal". LonelyPlanet.com. Retrieved 20 September 2016. ^ "Fodor's Travel – Saint Petersburg, Russia". Fodors.com. Retrieved 20 September 2016. ^ "Rick Steve's Europe – Saint Petersburg, Russia". RickSteves.com. Retrieved 20 September 2016. ^ "Rostelecom to invest RUB 15 bln in St Petersburg". Telecom Paper. 2 May 2014. Retrieved 3 May 2014. ^ Close (16 October 2005). "Where a symphony silenced guns". The Guardian. London. Retrieved 22 October 2009. ^ Vulliamy, Ed (25 November 2001). "Orchestral manoeuvres (part one)". The Observer. London. Retrieved 22 October 2009. ^ "Рэпер Моргенштерн снялся в клипе группы Little Big" [Rapper Morgenstern starred in a music video of the group Little Big]. mgazeta.com (in Russian). Retrieved 17 December 2018. ^ "Most Popular Titles With Location Matching "St. Petersburg, Russia"". IMDb. Retrieved 16 November 2012. ^ "the irony of fate sat in st.petersburg". Retrieved 26 August 2009. ^ "The XIX International "Message To Man" Film Festival". IFC Centaur. Archived from the original on 15 May 2009. Retrieved 9 June 2009. ^ "ОТЧЕТ за 2006/2007 учебный год". Retrieved 1 January 2009. ^ "History of Yacht Clubs in Russia". Encspb.ru. Retrieved 22 October 2009. ^ "Datsyuk adds KHL title to Stanley Cup victories". ^ "Первый матч "Зенита" на Крестовском острове посетили 11 тыс. человек". www.dp.ru. Retrieved 14 June 2018. ^ "Moscow–St. Petersburg motorway believed to be opened by 2018". eurasiatx. 18 April 2016. Retrieved 11 July 2017. Template:Update? ^ "Saint Petersburg Public Transportation Statistics". Global Public Transit Index by Moovit. Retrieved 19 June 2017. Material was copied from this source, which is available under a Creative Commons Attribution 4.0 International License. ^ "Бюпьюбяйхи Бнйгюк – Хярнпхъ". Russkialbum.ru. Archived from the original on 16 October 2012. Retrieved 16 November 2012. ^ "Results of train ticket inquiry, Russian train schedules and Russian train tickets". RZD.com. Retrieved 1 January 2011. ^ "Sapsan claims Russian rail speed record". Railway Gazette International. 7 May 2009. Retrieved 10 May 2009. ^ "Allegro trains suffered from the biggest problems in its history". St. Petersburg Travel Guide. 15 August 2016. Retrieved 27 November 2016. ^ "Россия – российские авиалинии". Rossiya-airlines.com. 25 July 2007. Retrieved 16 November 2012. ^ Powell, Bill & Brian Whitmore. The Capital Of Crime. (Saint Petersburg, Russia). Newsweek International, 15 May 2000. ^ ""Banditskiy Peterburg: Advokat" (2000)". IMDb. 27 February 2006. Retrieved 6 January 2009. ^ "Brat (1997)". IMDb. 16 April 1998. Retrieved 6 January 2009. ^ a b "Crime preventing measures have made good results: An official portal of the administration of St. Petersburg". Gov.spb.ru. 16 July 2012. Archived from the original on 24 March 2012. Retrieved 20 July 2012. ^ Postmedia News (16 March 2012). "Canada warns gay travellers to Russia on heels of law banning homosexual "propaganda"". National Post. Retrieved 13 June 2017. ^ a b c d e f g h i j k l m n o p q r s t u v w x y z aa ab ac ad ae af ag ah ai aj ak al am an ao ap aq ar as at au av aw ax ay az ba bb "Saint Petersburg in figures – International and Interregional Ties". Saint Petersburg City Government. Retrieved 23 March 2008. ^ "Barcelona's Sister cities". 2008 Ajuntament de Barcelona (City council's webpage). Archived from the original on 15 July 2009. Retrieved 1 December 2008. ^ "Bordeaux – Rayonnement européen et mondial" (in French). Mairie de Bordeaux. Archived from the original on 7 February 2013. Retrieved 29 July 2013. ^ "Bordeaux-Atlas français de la coopération décentralisée et des autres actions extérieures" (in French). Délégation pour l'Action Extérieure des Collectivités Territoriales (Ministère des Affaires étrangères). Archived from the original on 7 February 2013. Retrieved 29 July 2013. ^ "St. Petersburg to promote Cebu as tourism spot". Cebu Tourism News. Archived from the original on 4 February 2017. Retrieved 10 December 2016. ^ "Coloful Daegu". Archived from the original on 20 October 2008. Retrieved 1 December 2008. ^ "Dresden Twin cities". 2008 Landeshauptstadt Dresden (City of Dresden: Dresden.de). Archived from the original on 16 October 2008. Retrieved 1 December 2008. ^ "Gdańsk Official Website: 'Miasta partnerskie'" (in Polish and English). 2009 Gdańsk. Archived from the original on 23 July 2013. Retrieved 11 July 2009. ^ "Stadt Graz: Sister Cities". Archived from the original on 12 October 2010. Retrieved 1 December 2008. ^ "Twin Towns – Graz Online". graz.at. Archived from the original on 8 November 2009. Retrieved 5 January 2010. ^ "Le Havre Website – Twin Towns". (in English) 2006–2008 Ovidio Limited. Retrieved 30 November 2008. ^ "Los Angeles City Council: Sister cities of Los Angeles". Archived from the original on 19 July 2008. Retrieved 1 December 2008. ^ "Partner Cities of Lyon and Greater Lyon". 2008 Mairie de Lyon. Archived from the original on 19 July 2009. Retrieved 21 October 2008. ^ "Friendship Agreements". Manchester City Council. Archived from the original on 11 June 2008. Retrieved 1 December 2008. ^ "International relations: Saint Petersburg". Archived from the original on 26 September 2008. Retrieved 1 December 2008. ^ "City of Melbourne – International relations – Sister cities". City of Melbourne. Archived from the original on 5 July 2009. Retrieved 7 July 2009. ^ "Official Website of Municipal Corporation of Greater Mumbai". Municipal Corporation of Greater Mumbai. Retrieved 1 December 2008. ^ "Osaka and the World, the official website of the Osaka city". Archived from the original on 22 December 2008. Retrieved 1 December 2008. ^ "Tenerife". Archived from the original on 25 May 2010. Retrieved 27 February 2012. ^ "Twinning Cities". City of Thessaloniki. Retrieved 1 December 2008. ^ "Miasta partnerskie Warszawy" (in Polish). um.warszawa.pl. 4 May 2005. Archived from the original on 6 December 2008. Retrieved 29 August 2008. ^ "Zagreb Sister Cities". Archived from the original on 8 February 2008. Retrieved 1 December 2008. ^ "О городе Даугавпилс". Gorod.lv. Retrieved 12 March 2013. ^ "Twin cities of Riga". Riga City Council. Archived from the original on 4 December 2008. Retrieved 1 December 2008. ^ "Tallinn Facts & Figures 2015" (PDF). Tallinn City Enterprise Department. Retrieved 20 September 2015. ^ "Guide to Vilnuis". Archived from the original on 12 October 2010. Retrieved 1 December 2008. ^ "Yerevan – Partner Cities". 2005–2013 Yerevan. Archived from the original on 5 November 2013. Retrieved 4 November 2013. ^ "Yerevan Municipality – Sister Cities". 2005–2009 Yerevan. Archived from the original on 2 October 2011. Retrieved 22 June 2009. ^ a b c d e f g h i j k l m "Chairman of the Committee for External Relations of St. Petersburg". Retrieved 20 July 2012. ^ "Twinning with Palestine". Retrieved 29 May 2016. ^ "Hungary-Russia sister cities". Vengria.ru. Archived from the original on 19 September 2012. Retrieved 20 July 2012. ^ "Sister cities international". Archived from the original on 27 May 2008. Retrieved 1 December 2008. ^ "US Africa Sister Cities Conference" (PDF). U.S. Africa sister cities foundation. Archived from the original (PDF) on 27 May 2008. Retrieved 1 December 2008. ^ "Haifa agreement with partner" (in Russian). Mignews.com. Retrieved 20 July 2012. ^ "Twin cities of the City of Kosice". Magistrát mesta Košice, Tr. Retrieved 27 July 2013. ^ "Sister cities:Saint Petersburg, Russia". Archived from the original on 19 October 2008. Retrieved 1 December 2008. ^ "Le Havre – Les villes jumelées" [Le Havre – Twin towns] (in French). lehavre.fr. Archived from the original on 29 July 2013. Retrieved 7 August 2013. ^ "The city of Lviv, and its sister cities". Retrieved 1 December 2008. ^ "Online Directory: Russian Federation, Eurasia". Sister Cities International. Archived from the original on 8 September 2008. Retrieved 1 December 2008. ^ "Sister partners of Oslo". Archived from the original on 2 January 2009. Retrieved 1 December 2008. ^ "Porto Alegre's International Sister Cities Program". Porto Alegre, RS. Retrieved 22 August 2008. ^ "La Stampa – Torino-San Pietroburgo, c'è l'intesa sull'asse strategico". Lastampa.it. 22 June 2012. Retrieved 16 November 2012. ^ "Town of Westport, CT : Sister Cities Committee". westportct.gov. ^ "Milan severs twin city ties with St Petersburg over 'homosexual propaganda' ban". The Telegraph. 29 November 2012. Retrieved 30 November 2012. ^ Associazione Radicale Certi Diritti (23 November 2012). "Associazione radicale Certi Diritti | Gemellaggio tra Milano e San Pietroburgo: Consiglio comunale approva mozione che ne chiede la sospensione". Certidiritti.it. Retrieved 12 March 2013. ^ Associazione Radicale Certi Diritti. "Associazione radicale Certi Diritti | Venezia approva mozione per la sospensione degli effetti del gemellaggio con San Pietroburgo". Certidiritti.it. Retrieved 12 March 2013. Bater, James H. St. Petersburg: Industrialization and Change. Montreal: McGuill-Queen's University Press, 1976. ISBN 0-7735-0266-1. Hughes, Lindsey (2004). Peter the Great: a Biography. Yale University Press. ISBN 978-0-300-10300-7. Orttung, Robert W. From Leningrad to St. Petersburg: Democratization in a Russian City. New York: St. Martin's, 1995. ISBN 0-312-17561-2. Richardson, Daniel; Humphreys, Robert (2004) . St. Petersburg: The Rough Guide (5th ed.). New York, London & Delhi: Rough Guides. ISBN 978-1-85828-298-5. Retrieved 10 March 2010. Ivanov, S.V. (2007). Unknown Socialist Realism: The Leningrad School. Saint Petersburg: NP-Print Edition. ISBN 978-5-901724-21-7. .
Nezhikhovsky, R.A. (1981). Река Нева и Невская губа [The Neva River and Neva Bay]. Leningrad: Gidrometeoizdat. Vorhees, Mara (2008). St. Petersburg (5th ed.). Footscray, Victoria, Australia: Lonely Planet. ISBN 978-1-74059-827-9. Retrieved 11 March 2010. Wikimedia Commons has media related to Saint Petersburg. Wikivoyage has a travel guide for Saint Petersburg (Russia). Официальный портал администрации Санкт-Петербурга [The Official Portal of the Saint Petersburg City Authority] (in Russian). The Saint Petersburg City Authority: 191060, St. Petersburg, Smolny [Администрация Санкт-Петербурга 191060, СПб., Смольный]. 2001–2011. Retrieved 9 February 2011.